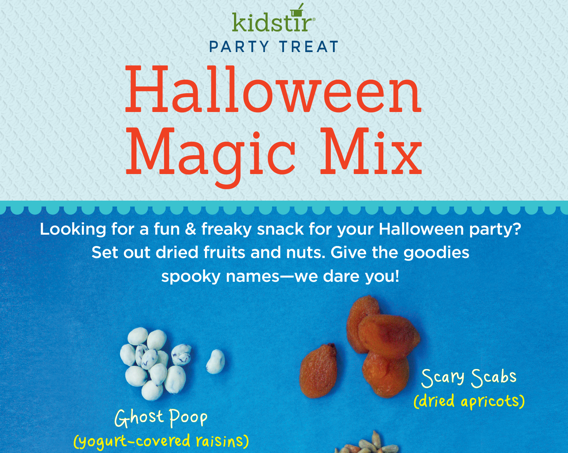 It’s lots of fun to serve scary Halloween snacks that are made from everyday foods like dried fruit, nuts and yogurt covered raisins. Being creative with presentation and descriptions is all it takes to spark kids’ excitement for these scary treats. Set the scene for these frightening foods— print scary signs to add imagination to your table with Spooky Tabletop Tags! Give your party food some freaky names. Cut out the cards from the scary signs on the dotted lines. Then fold them in half and set on a table. Place them next to your spooky snacks on Halloween night. Then tell your guests to go ahead and eat— we dare you! They’ll see these everyday snacks very differently. Consider our Spooky Celebration Kit when you subscribe in October. In this kit, you’ll find out how to make three Halloween recipes for fiendish food. You’ll also discover fun facts about kitchen witches and mummies, make mini jack-o’-lanterns, and play spooky food games. If you want to serve up a spooky halloween supper before trick-or-treating, try out this fun Spaghetti and Eyeballs recipe. Here are a few recipes from the Spooky Celebration kit: Try making Witch’s Brew. Use your new Freaky Freeze Mold to make skulls and bones for spiced apple cider. Then cook up some Scary-oli with the Pasta Press included in this kit. For dessert, bake Yummy Mummies for your party guests, then send them home with treat bags decorated with Spooky Stickers. 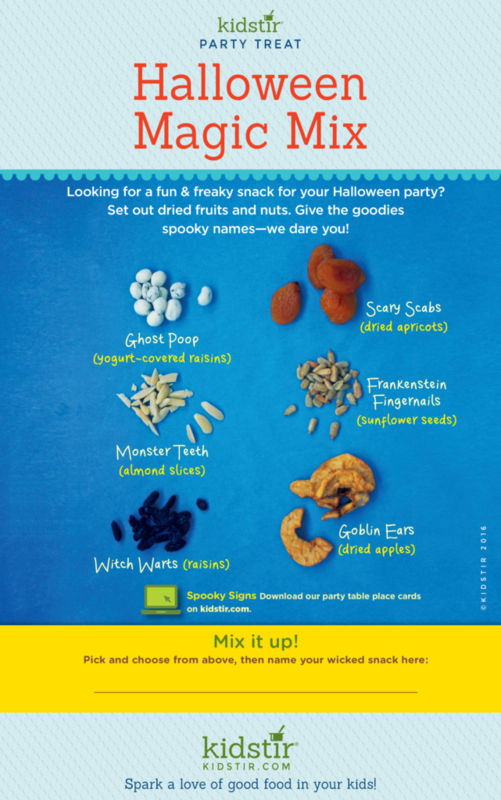 We’d love to offer this scary Halloween Snacks Infographic for you to share on your blog. Just select and copy the code snippet below and paste into your next blog post.